No doubt you’ve seen pictures of the glorious Maldives, resplendent with luxury villas suspended over glittering blue water – and maybe you thought that it’s really only a destination for people without children. Guess what? You’re wrong! The Maldives has a bit of a reputation for being an adults-only, no-kids-allowed kind of place, but actually over the last decade more and more resorts have sprung up there to cater for families with children. In fact, the kids’ pricing in lots of resorts is such good value that it costs much less than you might think to take the kids along. 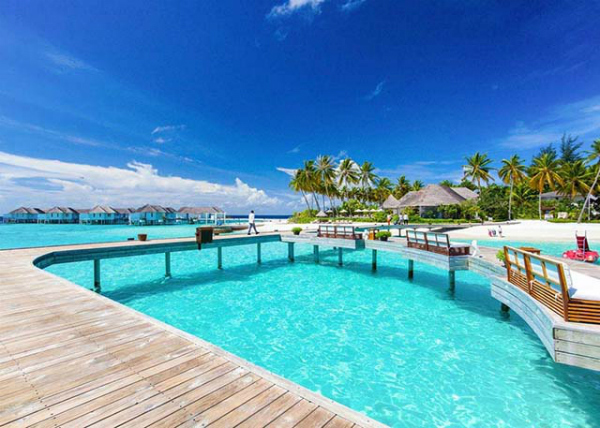 Here’s why you should consider the Maldives as a great option for a family holiday. Every luxury resort in the Maldives is on its own private island! What! With temperatures averaging 30°C year round (and water temperatures a beautiful 28°C), it’s always a good time to go there. And because the Maldives is equatorial in climate, rather than tropical, the weather is still pretty great even during the wet season. It isn’t subject to the same monsoonal weather systems as tropical destinations like Bali and Fiji. You won’t be risking days of cabin fever with the kids in the low season. And there’s no malaria there either! There’s no denying the Maldives is a fair distance from Australia, and that might make you concerned about your ability to manage the trip with children. But this trip is fun from the beginning. Your initial flight from Australia will probably stopover somewhere fun like Singapore, so you can break the trip up if you want to and see somewhere completely different at the same time. 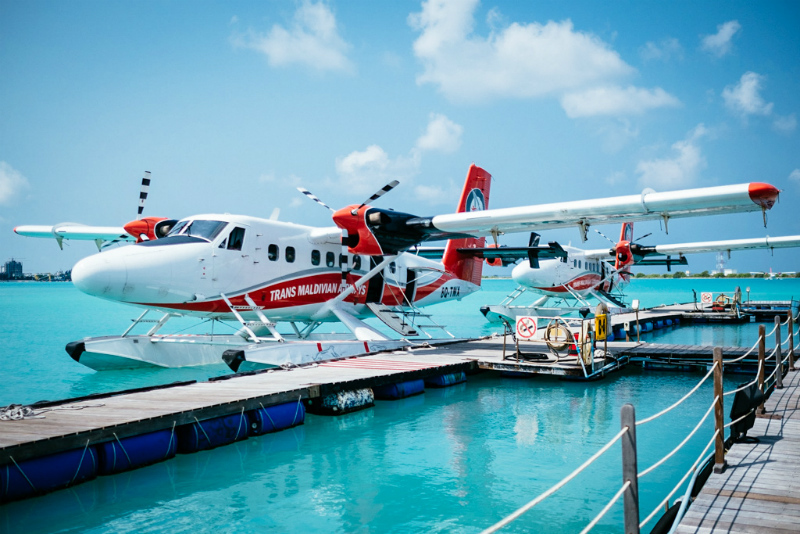 On top of that, when you land in Malé, the island capital of the Maldives, you’ll get to transfer to your accommodation by either seaplane (awesome!) or speedboat. It sure beats 12 hours crammed in the car together. 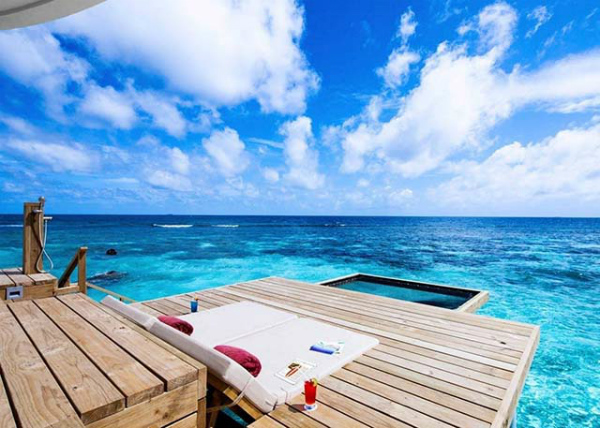 The Maldives is of course, famous for its over-water villas – it’s one of the few places in the world where you can stay in them. But there are also beachfront villas leading onto the sand, villas with private pools and more. They’re big too. 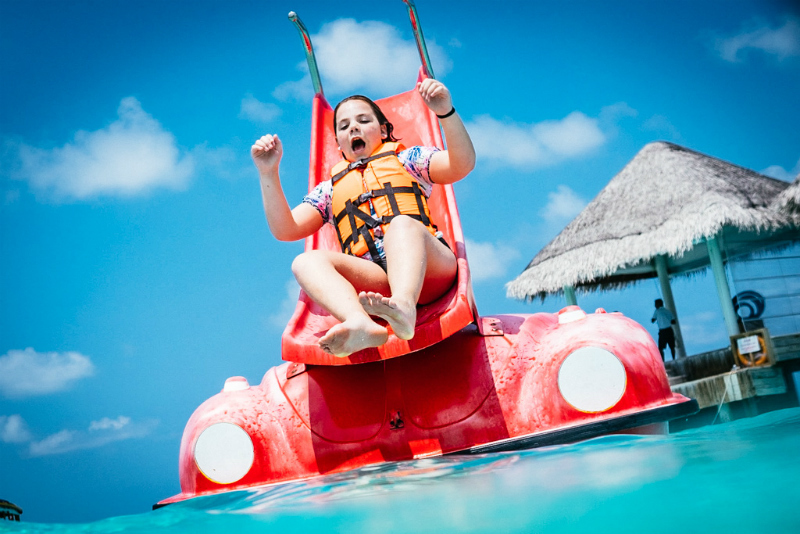 At the Centara Grand Resort Maldives, there are even deluxe family water villas which not only have secure terraces (so you can enjoy the view without fear for your kids’ safety), they even have a kids’ sleeping area with bunks and a Playstation! Not that they’ll need a Playstation once you factor in all the amazing things to do. Between cruises, water sports, snorkelling, fishing and more, nobody will be requesting screen time on this holiday. You can even swim with turtles and whale sharks! There’s a Kids’ Club, dedicated kids’ pool and babysitting service too. In fact, the Centara Grand Resort Maldives has been voted the Maldives’ most family-friendly resort for two years in a row. Visiting a luxury destination with kids can be nerve-wracking. Why? Because you’re aware that other guests have paid a lot to be there and probably don’t want to be splashed in the pool by your exuberant toddler. But the Maldives has plenty of adults-only resorts, which is actually great news for families with kids. It means that anyone who ISN’T at an adults-only resort has made that choice knowing that there will be children where they’re staying. In fact, they probably have kids with them too – so you don’t have to worry about your early risers wrecking anyone’s honeymoon. Not to mention, if you choose to stay somewhere with a kids’ club, the kids won’t even be disturbing you. Sometimes as parents we fall into the trap of thinking that lots of the truly great travel options are out of our reach simply because we have children. But provided we’re willing to plan a bit more thoughtfully, bucket list travel experiences don’t have to be out of reach. Being realistic about what your family requires to take your holiday from good to unforgettable is the first step. After all, shouldn’t every family have a truly unforgettable holiday experience together at least once?